"Swing Me Back to Texas" a tribute to "the boys who made the noise that's known as western swing", The Texas Playboys. To our knowledge, Kelli is the only woman to ever front the Bob Wills former band members. The title is also a song that made it to #4 internationally as well as the reference quote a line from the song. Kelli won Female Artist of the Year from the Academy of Western Artist and was the only female nominee for RMA Artist of the Year with "Asleep at the Wheel" winning. She is also a Texas State Musician Nominee and was inducted into the Western Swing Hall of Fame for her popularity and success in her Texas Musical Heritage. Grab your hats and spur up your boots for this Show / Dance as the Queen of Swing showcases her award-winning chart topping CD's: "Swing Like That" #6; Swings & Sings" singles #1 & #4; "Don't Mess With Texas" #1; Swing 'n Blues. Enjoy the wonderful stories about these legends and what it was like to ride the trail (road) with the King of Western Swing as told to her. 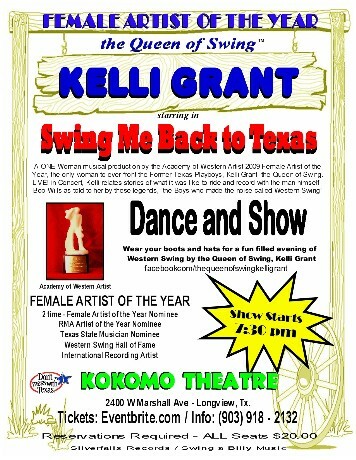 Please join us for this exciting show of Song, Stories and Memories of the King of Western Swing, Bob Wills and his Texas Playboys by this award-winning, multi-nominated and multi-talented Texas legend, Kelli Grant, the Queen of Swing.